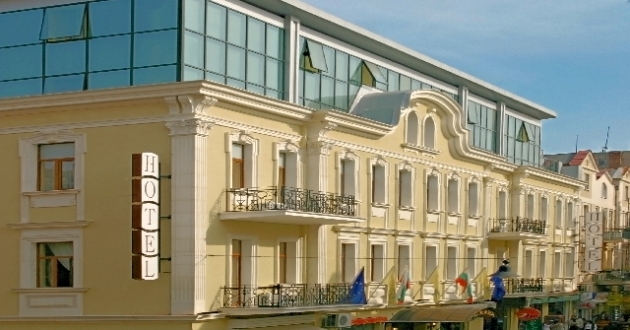 Location: The 4- star hotel Sveta Sofia is located on one of the most famous shopping streets in the heart of the capital, in the vicinity of the main city attractions and business infrastructure. Accommodation: 2 single rooms, 57 standarte rooms, 7 luxury double rooms, 5 triple room, 4 apartments, 1 VIP apartment. In each room - air- conditioning, direct dial telephone, satellite/ cable TV, internet access, minibar, bath/ WC, hairdryer, sound- proof windows, non- smoking rooms; Rooms are spacious and sunny. The luxury double rooms have Jacuzzi in the bathroom and balconies. There's a separate floor with non- smoking rooms. Food: Restaurant with 110 places, offering the finest dishes from the Bulgarian, European and alternative cuisine and a rich selection of local and imported drinks. Other services: room service, information, laundry and dry cleaning, conference rooms - "St. Sofia"- up to 100 places, "Sredets" -up to 50 places, both of them with modern equipment., shops and boutiques.